This Enermax Liberty ELT500AWT 500W Power Supply is the perfect power solution for a mid-range dual graphic card gaming system, balancing price, functionality, and performance in just the right way. It’s SLI and Dual Core CPU ready, ensuring that it won't be rendered obsolete by newer technologies. The silent 120 mm fan and modular cabling provide reduced vibration, lower noise emission, efficient cooling, and much better levels of performance. With Universal Input, ATX12V v2.2 and EPS12V compliance, and compatibility with both ATX and the upcoming New ATX (BTX) motherboard ensures that you can use your ELT500 in a variety of situations and places. Your W0117RU is long-lasting, and with an MTBF of 100,000+ hours, keeping you fighting long after you should’ve gone to bed. One main connector (20 + 4 pin), eight pairs (6 + 6) of eternity pair (SATA+4P Molex), two Floppy, and two PCI-E connectors are enough to hook up almost anything! Two +12V output (12V1, 12V2) allow support for the highest PC systems. With enough power to keep you running longer than you can get your thumbs to function, Enermax has the solution for your power needs. 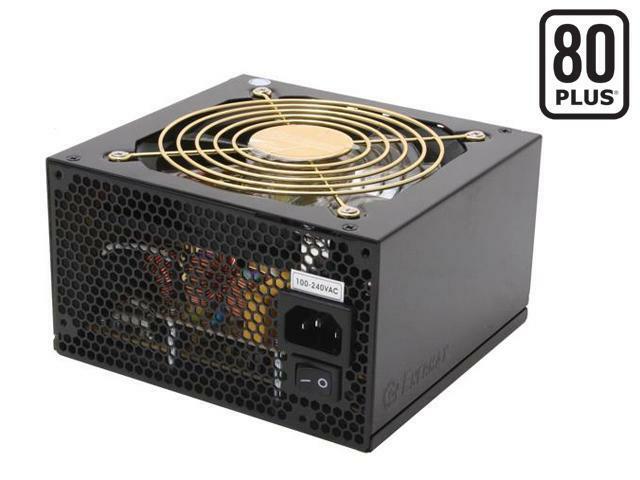 ATX12V v2.2 Compatible Compatible with the ATX12V v2.2 standard, the ENERMAX Liberty ELT500AWT power supply provides maximum power stability to drive the latest Intel and AMD processors as well as other system components. 500W Maximum Power A maximum power of 500W delivers safe, reliable output for high-end PC systems. Highly Efficient Delivering up to 80% efficiency, the ENERMAX Liberty ELT500AWT power supply saves energy and may even reduce your electric bill! Quiet Operation A low-speed 120mm fan ensures quiet operation through fan speed adjustments in response to load conditions. Advanced Modular Cable Management System An advanced modular cable management system reduces system clutter and optimizes internal airflow. NVIDIA SLI Certified The ENERMAX Liberty ELT500AWT power supply has gone through a series of rigorous NVIDIA SLI certification tests for maximum system stability when building NVIDIA SLI PCs. Pros: I recently purchased a new PSU, 850 watts, and I was curious to see when I purchased my current 500w Enermax. I purchased this PSU in 2006. The very computer I am currently typing on is powered by this enermax PSU. I have an intel 3570k overclocked to 4.0 ghz and a nvidia PNY 1060 gtx, with a couple of SSD cards as well as sound blaster sound card. My computer doesn't need much wattage but I've gone well past 10 years using this PSU, in various upgrades starting with DFI Lanparty all the way to my current z77. I've finally upgraded my PSU in order to power the latest video cards which usually require an 8 pin, so I am putting this one aside. Just wanted to share my experience, Happy Shopping. Thank you for your support and purchase. We really appreciate you taking time for review and suggestion. Pros: Still going strong after 6 years! Will buy an Enermax PSU again. Cons: It died and took my motherboard, as evidenced by the blown capacitors. Still tests good, but doesn't boot with other PCs. I'm not happy to have to buy yet another part to replace what this one killed. Other Thoughts: A couple of years lifetime isn't bad, but it took my motherboard with it. That makes me very unhappy. Built a new system and plugged it in there, and it doesn't boot. I can hear this PS ticking. Not good. Other Thoughts: My power supply went out after 6 years in a gaming rig. paper clip trick shows it has power, but doesnt boot the machine. Tested on multiple motherboards. Pros: Brilliant build quality. As the title says, I've had this since 2007 and it's currently powering my Phenom II, Radeon 6870 computer. It's rated for 500W and is ROCK SOLID. I couldn't imagine I'd still be using it. My card requires a 600W PSU, but this thing runs it no problem. Brilliant. My next computer will definitely have a PSU as close to this one as I can. It's modular, so I only use the cables I need. Perfect. Cons: Can't think of one. It's quiet, and hasn't had a lick of problems. Other Thoughts: Just great. I would give it 10 stars if I could. For reals. Pros: Modular wiring, PFC Active, 80 PLUS Certified. Mine has ran nearly 24/7 for over 6 years of gaming and streaming. Quality. Cons: Not strong enough for modern SLI setup. Other Thoughts: Has been running strong since 4/2006 through 3, possibly 4 soon, CPU/GPU upgrades. With the lower power requirements of today's CPUs, I may not have reason to upgrade even now. Cons: Died after 2 and half years in my moms computer, took out her motherboard also. Enermax PSUs are backed by 3 years warranty and some units even have 5 years. Please submit a RMA request for your replacement. If the unit has been discontinued we will replace your unit with a current equal spec product. Please follow this link for the RMA request.